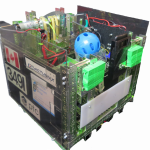 The first FTC Payette league event of the season is on Saturday, Dec. 8, 2018 at the Wilson School of Design in Richmond BC. (room 4900 – 5600 Kwantlen St, Richmond, BC V6X 3V8). There is a pay parking lot at the School. Everyone is welcome to come and watch. Teams should arrive just after 10am, but visitors should plan to arrive after 1pm. The best viewing is probably between 2-3:30pm.